Hey guys! It's been a while since I have gotten to test out some new goodies from Carmex. I just received this cute beach bag and 6 Carmex sticks just in time to replenish our supply. Yes, I said supply. We always keep extra Carmex on hand! Carmex sent us the sticks in all 6 flavors- Original, Strawberry, Cherry, Lime Twist, Vanilla and the brand new Pomegranate. My oldest daughter immediately called dibs on the Pomegranate and the younger one picked the Vanilla. Looks like the rest of us will have to duke it our over the others. I personally can't get enough of the Original and the Lime Twist. I always wear it under my lip color and sometimes I will wear just Carmex alone. Who needs color when your lips feel soft and smooth anyway? I also really love the convenience of a stick because it can easily fit in my pocket for days I am not carrying a bag. My daughter is already hooked on the new Pomegranate flavor. She has already requested that we look for it in our local stores so she will have some back-up sticks. What can I say, we are a Carmex family. As I write this post, my 4 year old is begging for a new Cherry Carmex. 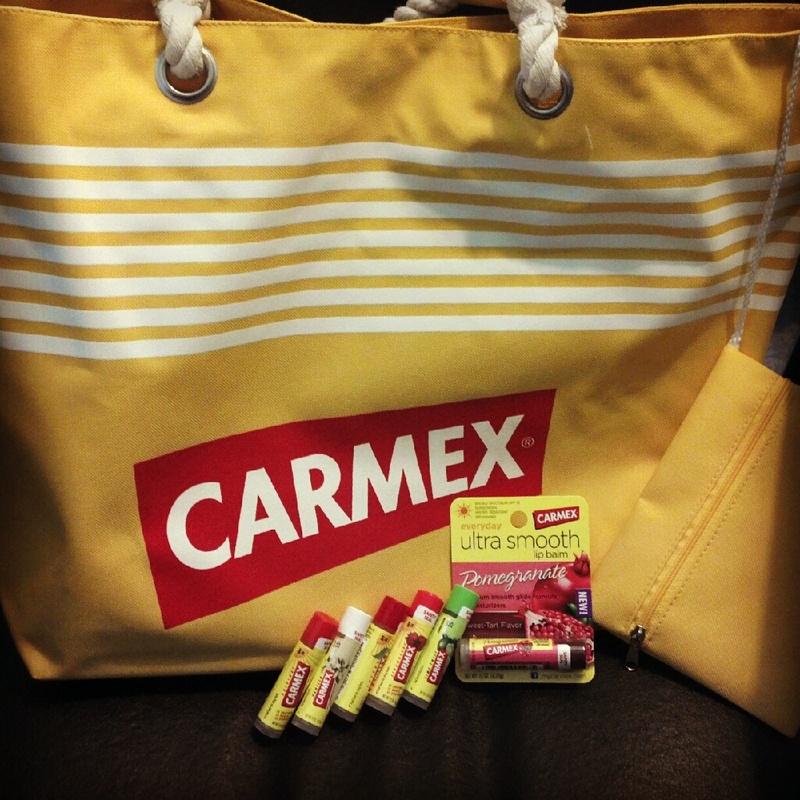 Just in time for the summer, Carmex is providing us with an extra gift set just for one lucky Momfiles reader to win. You will get the same beach bag and 6 Carmex sticks like I did. Entering is easy, just check out the Rafflecopter widget below. Giveaway open to US Residents only and will close on August 9, 2012. One winner will be chosen via random.org and contacted via email so be sure to leave a valid email address in the event you win. Be sure to complete mandatory entry in order for extra entries to count. Failure to follow rules will disqualify all entries. Momfiles is not responsible for any lost or stolen prizes. Good luck! Disclosure: I received a gift set for review purposes and all opinions are 100% my own. I like Carmex Original (and yes we keep a supply too!) and I would be interested in the cherry as well. I'm looking forward to the new Pomegranate flavor:) *Thanks* for the giveaway! i would love to try the pomegranite!